Through ExpressExtension.com taxpayers can E-File a tax extension with the IRS in only a few minutes. ExpressExtension takes a complicated IRS Form and turns it into a series of simple questions. When you file a tax extension with ExpressExtension, it can be completed in just a few minutes because there is no confusing tax jargon, and instead there is an easy to navigate self-guided system. With prices starting at $9.95 it is by far the best value in the industry! File IRS Form 8868 for a Non-Profit Organization 3 Month Tax Extension, the price is just $9.95. Since the Non-Profit Tax Extensions are only 3 months, it is possible to E-File for an additional 3 months through Express Extension as well. 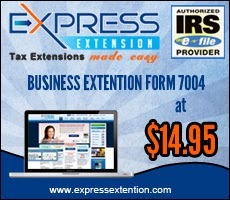 Individuals can file a tax extension for a personal tax return using ExpressExtension.com for only $12.95. Individuals, Contractors, Single Member LLCs, and Sole Proprietors may file the IRS Form 4868 for an automatic 6 month tax extension. The deadline for this form is April 15. Businesses can use ExpressExtension.com to file an IRS Form 7004 for $14.95. This form must be filed by March 15 and guarantees an automatic 6 month extension to file a tax return. Different types of businesses may use this form, such as: C-Corporations, S-Corporations, Multi-Member LLCs, Partnerships, Trusts, and Estates. For questions about filing Tax Extensions, you can contact the Express Tax Support Center in Rock Hill, SC at 803-514-5155 between the hours of 8am – 6pm EST, Monday through Friday or email support@ExpressExtension.com.